For life on the home frontier. A British design company making furniture which lends itself to change and serves its purpose better. George Gold + Co are an unique furniture design company based in Yorkshire. George’s furniture is designed to adapt and change with people throughout their lives; providing pieces that are intended to last forever. As a qualified teacher, George is also a passionate advocate for Design and Technology education, and the benefits it offers to students problem solving and creative skills. George’s belief in design education resonated strongly with us at Wired Canvas. As designers ourselves (albeit using pixels, not wood) we understand the importance of creative thinking, and the impact that can have across everything in your life. We were thrilled to help George communicate these strong beliefs through his new brand and website. George asked us to help him develop a new professional brand and ecommerce website to sell his products online. Most importantly though, he wanted us to help him successfully communicate his story and purpose through his marketing. As lovers of design and beautiful furniture ourselves, it was a huge pleasure to work with a maker so passionate about his craft. The ultimate goal for George’s new brand and website was, of course, to increase sales. But more importantly it was also essential to ‘tell the story’ of George’s unique furniture pieces. 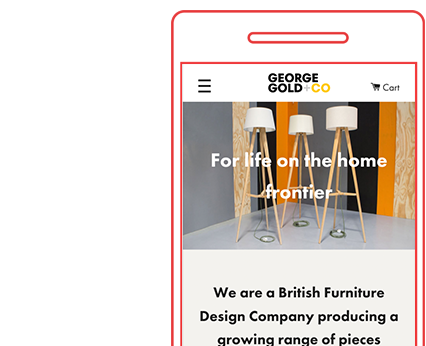 The brand development was vital to help George Gold + Co stand apart from other furniture makers. It was clear from the outset that George didn’t simply want a standard ecommerce store. The product pages needed to communicate that each piece is made by hand, built to last and driven by usability; the function guides the form. George’s enthusiasm, belief and personal passion for design education also needed to shine through the brand and website’s language. We worked through an in-depth research phase with George, in which we asked him hundreds of questions (sorry for the third degree, George!) and gained a strong understanding of his audience, goals and purpose. This process resulted in many little brilliant quotes that later became part of the website’s copy and story. We workshopped through a number of brand routes internally prior to presenting a range of options to George. It was during one of the very first draft brand concepts that we showed him that he announced “that’s the one!”. George spoke a lot during the research phase about his furniture ‘making less do more’. Therefore we felt the brand should reflect this ethos. It needed to feel simple, iconic and able to adapt to lots of uses. We therefore treated these three elements as separate but connected entities within the logo, able to fit to any space or dimensions. This provided a flexible structure using three complimentary parts; much like George’s adaptive furniture. Aesthetically the design was informed by the many ‘circular’ letters within the words George Gold + Co, which was a happy coincidence. We chose a contemporary font with very circular shapes, and customised it to create a bespoke logo mark. The yellow immediately felt bright, warm and friendly. Part of the original brief was for George to sell his products online, and we knew from past client projects that Shopify would provide a powerful, secure and cost-effective ecommerce platform. We developed a completely bespoke Shopify theme that works exactly to George’s requirements, with memorable story-telling and large images. It needed to feel slick and high quality, whilst also feeling friendly and accessible. George’s products are top-end but also designed for real life, and the website needed to communicate that authenticity and warmth. Instead of a standard ‘about’ page, George Gold + Co tell ‘Our Story’. Instead of a standard news or blog page, we created a Journal. The product pages are detailed, engaging stories. Shopify handles all of the unpleasant headaches that ecommerce normally entails - shipping, checkout, payment providers - leaving us to instead focus on capturing George Gold + Co and highlighting effectively their brilliant product range. George’s products are not simply ‘off the shelf’ furniture. They have been designed with a huge amount of thought, often being refined over many years. When customers buy a piece, they are also buying the story behind the design. Therefore it was vital that the product pages captured this history. We designed highly engaging product pages, broken up with images of the final piece, functional details and images of the production process. Alongside this, we included original product design drawings from George’s sketchbooks, and animated gifs to show how the products move and adapt to different spaces. We worked with George to identify and refine his core messaging and tell the story of the company, and communicate that through the website copy. George speaks enthusiastically and openly about his work, and we knew that it was important that his copy was authentic and captured his natural tone of voice. Therefore we provided some guidelines, and George wrote the bulk of the content. We then helped him tailor it into clean, impactful copy that captures the essence of George Gold + Co.